15 January 2004 – United Nations Secretary-General Kofi Annan will seek to recruit business leaders at the annual World Economic Forum in Davos, Switzerland, next week in what he sees as the crucial task of making globalization work for the world's people. Five years ago in Davos, Mr. Annan launched a Global Compact aimed at involving the private sector in upgrading environmental, labour and human rights conditions. According to UN officials, during his keynote address to the Forum on 20 January, the Secretary-General will laud progress achieved since then while warning that the current critical juncture in international affairs requires continued efforts to build an open, rules-based global economy that works for the world's people. Towards that end, he will enlist the intensified help of the business community. The Davos speech will come on the second day of a 12-day, seven-city, European trip set to begin on Monday evening, when Mr. Annan will arrive in Baden-Baden, Germany, a UN spokesman announced today. He will receive the German Media Prize on Wednesday and hold talks with the country's Foreign Minister, Joschka Fischer. After the World Economic Forum, Mr. Annan will travel to Stockholm, where on 25 January, he will meet the Prime Minister. The following day he will address the opening of the Stockholm International Forum 2004 - Preventing Genocide: Threats and Responsibilities. In Paris the following day, the Secretary-General is scheduled to attend a working luncheon hosted by French President Jacques Chirac and to address a Global Compact meeting. On 28 January, Mr. Annan will be in Brussels for meetings with the NATO Secretary-General, the European Union College of Commissioners, the European Commission President and the Irish European Union Presidency. The following day, he will receive the Sakharov Prize at a European Parliament ceremony. After that he has meetings scheduled with top Belgian officials. Still in Belgium that Friday, the Secretary-General will be receiving an honorary doctorate awarded to him last year by the University of Gent. On his final stop, in Geneva, Mr. Annan has meetings scheduled with President Luis Inacio Lula da Silva of Brazil and President Chirac. He will also meet - separately and later jointly - with President Olusegun Obasanjo of Nigeria and President Paul Biya of Cameroon. A three-day international forum entitled "Preventing Genocide: Threats And Responsibility" is scheduled to open in Stockholm next Monday. According to a release from the Swedish Embassy here, the Prime Minister of Sweden, Goran Persson, had invited some 60 heads of state and government to Stockhom for the fourth Stockholm International Forum which would address some of the most acute humanitarian, political and moral challenges facing the international community; The release said that the conference would be the last of the Stockholm Forum series. The first, which took place in January 2000, was a historic assembly of world leaders, resulting in the "Stockholm Declaration on Holocaust Education, Remembrance and Research." The two subsequent conferences "Combating Intolerance" (2001) and "The Conference on Truth, Justice and Reconciliation" (2002), continued the essential international discussios on these inter-related themes. The conference would seek to establish an overall perspective useful in understanding the evil phenomenal of genocide and genocidal violence. The discussions will represent the first, major inter-governmental conference of the issue since the adoption of the Convention on the Prevention and Punishment and Punishment of the Crime of Genocide by the United Nations in 1948, it was learnt. The United States has announced Ambassador Pierre-Richard Prosper, the U.S. Ambassador-at-Large for War Crimes Issues, will lead the U.S. delegation to the Stockholm International Forum 2004 in Sweden January 26-28. The fourth and final Stockholm International Forum will address some of the most difficult challenges facing the international community regarding genocide and will discuss ways to prevent genocide and genocidal violence Following is the press release: U.S DEPARTMENT OF STATE Office of the Spokesman January 26, 2004 Media Note AMBASSADOR PIERRE-RICHARD PROSPER TO LEAD U.S. DELEGATION TO THE STOCKHOLM INTERNATIONAL FORUM 2004: PREVENTING GENOCIDE: THREATS AND RESPONSIBILITIES Ambassador Pierre-Richard Prosper, the U.S. Ambassador-at-Large for War Crimes Issues, will lead the U.S. Delegation to the Stockholm International Forum 2004, which will take place in Stockholm, Sweden from January 26-28. The U.S. Delegation will include other distinguished members from government and the private sector, including Ambassador Ed O'Donnell, U.S. Special Envoy for Holocaust Issues, Congressman Jim Leach of Iowa, Rabbi Arthur Schneier, President, Appeal of Conscience Foundation, Mr. Fred Schwartz, President, The Auschwitz Institute for Peace and Reconciliation, and Mr. Jerry Fowler, Committee of Conscience Staff Director at the United States Holocaust Memorial Museum. The fourth and final Stockholm International Forum will address some of the most difficult challenges facing the international community regarding genocide. The U.S delegation will participate in plenary sessions and workshops with other experts, policymakers and politicians to share ideas and discuss different perspectives in order to fully consider ways to prevent genocide and genocidal violence. .
STOCKHOLM : Security was tight in the Swedish capital Stockholm as UN Secretary General Kofi Annan and ten heads of state or government joined other delegates from some 60 countries for a conference on ways to prevent genocide, ethnic cleansing and mass killings. Among the delegates at the three-day "Preventing Genocide" conference, opening Monday, were representatives from nations with experience of mass killings, including Armenia, Bosnia-Hercegovina and Rwanda. "After World War II, everybody said: 'never again', and yet genocide happened," Annan told reporters after a meeting with the conference's host, Swedish Prime Minister Goeran Persson. "We will try to find ways to nip the problem in the bud," he added. 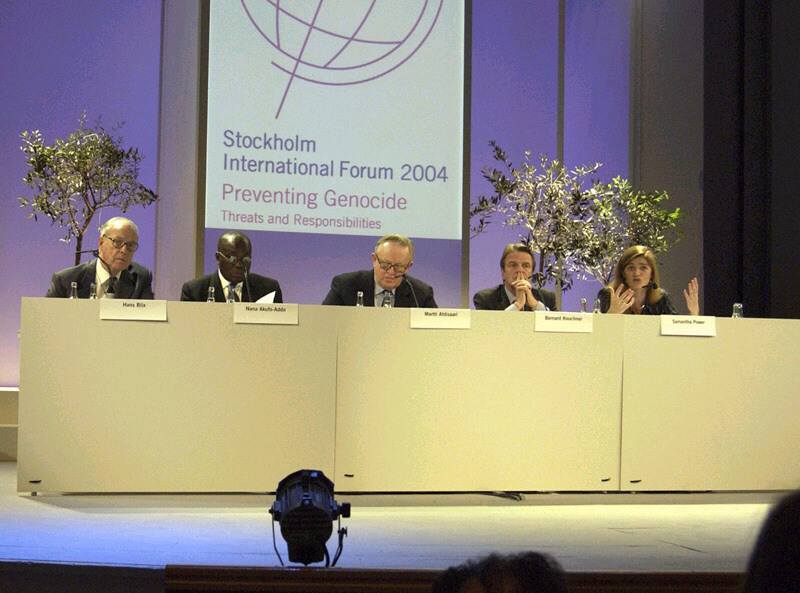 Persson is the only western European leader attending the genocide conference, the fourth and final one in a "Stockholm International Forum" series initiated by Persson in 2000. Some governments sent justice ministers, whose portfolio include international law, and others have dispatched specialised academics and researchers. Security was tight in the centre of Stockholm as police cordoned off streets around the Norra Latin conference centre and put up barriers and tape to prevent cars from parking nearby. The European Union is represented by foreign policy chief Javier Solana. Organizers stressed that the talks are to focus on the future, and will be based on "the principle of the international community's joint responsibility for preventing genocide". "Many countries and observers feel that the international community could have done more to prevent genocide in the past," conference spokesman Stig Berglind told AFP. The conference will be the first major inter-governmental conference on the issue since the adoption of the UN Convention on the Prevention and Punishment of the Crime of Genocide in 1948, Berglind said. "'Never again' must not become a mere incantation," Persson said in a statement released ahead of the conference. Israel, whose creation as a state followed genocide against the Jewish people, will take part in the conference. The country's presence will, however, be low-key, after it came near to cancelling altogether following a full-scale diplomatic controversy with host country Sweden over an art exhibit a week ago. The conference closes Wednesday, and organizers said they hope for a final declaration and follow-up mechanisms and conferences. STOCKHOLM, Sweden (AP)  Warning massacres like those carried out in Rwanda and Bosnia could happen again, UN Secretary General Kofi Annan today proposed an international committee to help prevent genocide. Annan made the proposal at the opening of a three-day conference in Stockholm on preventing genocide.More than a half a million people were slaughtered during the 1994 war in Rwanda. A year later in Bosnia, some 8,000 Muslim men and boys were massacred in Srebrenica, in eastern Bosnia, during the Balkan wars. "I long for the day when we can say with confidence that, confronted with a new Rwanda or new Srebrenica, the world would respond effectively, and in good time," Annan said. "But let us not delude ourselves. That day has yet to come. "Annan suggested forming a UN committee on preventing genocide and having a "special rapporteur" who would report directly to the Security Council to monitor "massive and systematic violations of human rights and threats to international peace and security." Several delegates welcomed the idea, including Sweden's Prime Minister Goeran Persson and Latvia's President Vaira Vike-Freiberga, who said "there have been many failures when it comes to preventing genocide during the last years." The event is the first major intergovernmental conference on the issue since the United Nations adopted its Convention against Genocide in 1948. Security was tight, with 1,500 police officers patrolling the area. The conference is the final one in a series of annual conventions called the Stockholm International Forum, which began with a conference on the Holocaust in 2000. Organizers said they hoped delegates would sign a declaration with commitments from 60 countries to improve efforts to prevent genocide. Participants include former foreign affairs minister Lloyd Axworthy, as well as the European Union's foreign policy chief Javier Solana; former chief UN weapons inspectors Hans Blix and Rolf Ekeus; International Criminal Court prosecutor Luis Moreno-Ocampo, and Nobel Peace Prize winners Bernard Kouchner and Elie Wiesel. Israel downgraded its representation after a Stockholm museum refused to remove a display showing a picture of an Islamic Jihad suicide bomber from an exhibit linked to the conference. Israel said the piece glorified suicide bombers. The Israeli-born artist who created the installation, Dror Feiler, was among hundreds who protested Monday against Israel's presence at the event. U.N. Secretary-General Kofi Annan's call for a monitor to help prevent future acts of genocide is a bold and welcome step, Human Rights Watch said today. Speaking today at an international conference on genocide prevention in Stockholm, Annan suggested that the United Nations consider appointing a Special Rapporteur on the Prevention of Genocide. This monitor would report to the Security Council so that it could take action when genocide was impending. Annan also proposed creation of a U.N. Committee on the Prevention of Genocide to recommend actions to combat genocide. "Too many times, the world has stood by and watched as genocide was committed," said Rory Mungoven, global advocacy director for Human Rights Watch. "Kofi Annan's proposal would make sure that the Security Council was on notice that genocide was being planned. No one would be able to say they didn't know." Human Rights Watch noted that even with the Secretary General's proposal, U.N. member states would still need the political will to act. "No early-warning mechanism will substitute for political will," said Mungoven. "But this would put intense pressure on the Security Council to act before it was too late." Kofi Annan, the United Nations secretary-general, yesterday called for new measures to prevent genocide, saying the world community had not yet shown it could stop mass killings and ethnic cleansing. "I long for the day when we can say with confidence that, confronted with a new Rwanda or a new Srebrenica, the world would respond effectively and in good time. But let us not delude ourselves, that day has not yet come," he told a Swedish government conference on preventing genocide in Stockholm. He proposed setting up a UN committee and a "special rapporteur" to deal with genocide issues. The latter would report directly to the Security Council and make clear the link "between massive and systematic violations of human rights and threats to international peace and security".Mr Annan criticised the international community's failure to prevent genocide in the 1990s, referring specifically to Rwanda where 800,000 people were killed in 1994 and Srebrenica in Bosnia where 8,000 Muslims were killed a year later. "The international community clearly had the capacity to prevent these events, but it lacked the will," he said. UN member states, and especially the Security Council, had made the "gravest mistakes". Göran Persson, Swedish prime minister, stressed that the world had the tools to prevent genocide - including legislation and courts, sanctions, diplomatic channels and military intervention.The conference has been criticised for not focusing on conflicts, such as the Middle East. Representatives of certain persecuted minorities have not been invited. The Swedish government took the decision deliberately to stop its agenda becoming bogged down. Bill Rammell, parliamentary under-secretary of state at the UK Foreign Office, said a crucial element to the debate was determining when it was right to intervene in another country's affairs. "We have got to try and build a consensus that state sovereignty doesn't mean the freedom to do whatever you want in terms of human rights. "The final conference declaration is expected to call for better early warning systems and a greater commitment that perpetrators of genocide are brought to justice.The conference is being attended by delegations from more than 50 countries. Prague, 26 January 2004 (RFE/RL) -- An international conference on preventing genocide began today in the Swedish capital, Stockholm. In the keynote address, UN Secretary-General Kofi Annan said the world had the capability but lacked the will to prevent the mass slaughters of the 1990s, particularly in the former Yugoslavia and Rwanda. "The events of the 1990s, in the former Yugoslavia and [in] Rwanda, are especially shameful," Annan said. "The international community clearly had the capacity to prevent these events, but lacked the will. Those memories are especially painful for the United Nations." Annan said a small outside force -- perhaps as few as 5,000 soldiers -- could have stopped the Rwandan slaughter in the early stages, but that there was a failure of the UN, the U.S., and other powers to act. "In Rwanda in 1994, and in Srebrenica in 1995, we had peacekeeping troops on the ground at the very place and time where genocidal acts were committed. But instead of reinforcing the troops, we withdrew them." Up to 1 million Tutsis and Hutu moderates were massacred in the Rwandan genocide in 1994. More than 7,000 Muslim men and boys were killed when Serbian forces captured the Bosnian town of Srebrenica in July 1995. Swedish Prime Minister Goran Persson has invited representatives of some 60 governments to attend the three-day conference in Stockholm. Its aim is to gain an overall understanding of the problem of genocide and pave the way for preventive action. The Stockholm meeting is the first conference of this format at government level to be held since the UN adopted the Convention on the Prevention and Punishment of the Crime of Genocide in 1948. Persson emphasized the aim of the conference in his opening remarks: "The task is ours. There is no one else. We, together, must take action. We are here to discuss what action -- how do we prevent future genocides?" The main work of the conference will be conducted by panels consisting of prominent participants, as well as in a number of workshops within four key areas -- threats, responsibilities, prevention, and awareness. Persson said he decided to host the conference due to his outrage over anti-Semitic incidents that have occurred in Sweden. He says a large percentage of Swedish youth are prepared to believe those who assert that the Holocaust did not happen. As a response, Persson has launched a comprehensive education campaign about the Holocaust. "Whether we lack economic resources or not, when priorities are set, genocide prevention has to be on the list," Persson said. "We do not lack political means -- legal tools such as legislation and courts, sanctions, humanitarian aid, diplomatic channels, international arenas for political decision-making or -- as a last resort -- military forces," Persson said. This is the fourth and final conference in the Stockholm International Forum series. The first, which focused on the Holocaust, took place in January 2000. Political leaders from around the world adopted a Declaration Promoting Holocaust Education, Remembrance, and Research. Two other conferences -- on combating intolerance and on truth, justice, and reconciliation -- took place in 2001 and 2002. One of the fundamental ideas of the present conference is to create a forum for exchange between leading politicians, decision-makers, and experts. Issues due to be discussed include how to detect the threat of an impending act of genocide, mass murder, or ethnic cleansing, and how can the international community's diplomatic, legal, humanitarian, economic, military and other tools be better used for the prevention of genocide. Paul A. Levine, a lecturer in Holocaust history at the University of Uppsala, has remarked that the genocide conference is taking place at an interesting and troubled time -- for Sweden, Europe, and the world at large. "The events of the 1990s, in the former Yugoslavia and [in] Rwanda, are especially shameful." "A very different atmosphere characterizes affairs today than when the inaugural forum convened in January 2000," Levine said. "The specter of international terrorism casts a shadow over our daily life and liberties. The invasion of Iraq and its baleful aftermath is causing international anxiety. And, in Europe, not least, we are witnessing a deeply disturbing outburst of anti-Semitism." Persson reiterated this concern in his opening remarks today. "The failure of governments to break unemployment, to reduce poverty and social gaps, to stop corruption and organized crime, make people turn their back on democracy. Democratic forces must be prepared to address this despair," Persson said. In Stockholm, an anti-war coalition is criticizing Swedish officials for failing to invite representatives of the Palestinians, Chechens, and Kurds. Joergen Hassler of Network Against War said it is "ridiculous that a conference on genocide does not touch on current situations where genocide could arise." In connection with the Stockholm conference, an extensive international cultural program is being arranged, including a film festival, exhibitions, music events, discussions, seminars, and many other cultural activities. United Nations Secretary-General Kofi Annan has proposed establishment of a U.N. committee on the prevention of genocide. Mr. Annan told a conference in Stockholm he is recommending creation of a special U.N. official who would report to the Security Council on efforts to prevent genocide. The secretary-general said he hopes for a day when the world can respond rapidly and responsibly to situations such as arose in Rwanda and in the former Yugoslavia in the 1990s. He referred to the deaths of at least 7,000 Muslims after Serb forces captured the enclave of Srebrenica in eastern Bosnia-Herzegovina, and to the killing a million or more Tutsis and moderate Hutus by Hutu tribesmen in 1994. He called it shameful that the international community took no timely effective action in those cases.Organizers of the Stockholm Conference on the Prevention of Genocide say it is the first major intergovernmental conference on the subject since adoption of the U.N. Convention against Genocide in 1948. Some information for this report provided by AP and AFP. UN Secretary General Kofi Annan has called for the creation of a commission to forestall future acts of genocide. He told a world conference on the issue in Stockholm that the mass killings of the 1990s in countries such as Rwanda could not be allowed to happen again. He said he longed for the day when "confronted with a new Rwanda... the world would respond effectively". This week's forum is first conference of its kind since the UN's 1948 resolution against genocide.Mr Annan called for the creation of both a UN commission and a special rapporteur on the prevention of genocide. GENOCIDE Defined as any act aimed at the destruction of all or part of a national, ethnical, racial or religious group of people.The rapporteur would report directly to the UN Security Council to quickly identify links between "massive and systematic violations of human rights and threats to international peace and security", the UN chief said at the start of the three-day conference. "The events of the 1990s, in the former Yugoslavia and in Rwanda, are especially shameful," said Mr Annan. "The international community clearly had the capacity to prevent these events but it lacked the will." The forum is being attended by delegates from 58 states, including 13 international organisations.Among those states represented are some with experience of mass killings such as Armenia, Bosnia-Herzegovina and Rwanda. However, Swedish Prime Minister Goeran Persson is believed to be the only Western leader at the conference. Israel has a delegation at the forum but its attendance was in doubt earlier when the Israeli ambassador to Stockholm attacked an art installation depicting a Palestinian suicide bomber, which he branded as anti-Semitic. After threatening to pull out of the conference altogether unless Stockholm apologised for exhibiting the artwork, Israel instead downgraded the level of its delegation which was originally to include President Moshe Katzav. Associated Press 27 Jan 2004. STOCKHOLM, Sweden -- UN Secretary-General Kofi Annan warned Monday that genocide could happen again and proposed a new international commission to help prevent future mass killings. "I long for the day when we can say with confidence that, confronted with a new Rwanda or new Srebrenica, the world would respond effectively, and in good time," Annan said at the opening of a three-day conference on preventing genocide. "But let us not delude ourselves. That day has yet to come." Annan was referring to the mass slaughter of civilians during the 1994 war in Rwanda and the massacre of 8,000 Muslim men and boys a year later in Bosnia during the Balkan wars.He proposed setting up a UN committee and a "Special Rapporteur" on the prevention of genocide. The rapporteur would report directly to the Security Council to quickly identify links between "massive and systematic violations of human rights and threats to international peace and security," Annan said. The proposal was welcomed by several delegates at the conference in downtown Stockholm. "There have been many failures when it comes to preventing genocide during the last years," Latvian President Vaira Vike-Freiberga told reporters. "Every concrete measure that could improve the situation must be welcomed by all." Swedish Prime Minister G?ran Persson also welcomed the idea, saying "there are good possibilities that it would work." Earlier, Persson called on delegates to move beyond pronouncements of "never again" and take early action to stop genocide. "We do not lack information, horrendous stories, facts. But we have to improve our ability to believe them, to believe the unbelievable," he said. The conference got under way amid strict security in the Swedish capital, with 1,500 police officers guarding participants, sealing off streets and creating huge traffic problems. A diplomatic dispute between Sweden and Israel over a controversial art exhibit threatened to overshadow the conference a week before it started. Israel downgraded its representation after a Stockholm museum refused to remove a display showing a picture of an Islamic Jihad suicide bomber from an exhibit linked to the conference. Israeli Ambassador Zvi Mazel tried on Jan. 16 to vandalize the installation, saying it glorified suicide bombers. Sweden said his actions were unacceptable. The head of the Israeli delegation, Nimrod Barkan, told the conference there had been an upsurge in hate speech against Jews in the past three years, particularly from Muslim leaders. Stockholm - The Holocaust was the greatest failure possible, Swedish Prime Minister Goran Persson told the Stockholm International Forum on the Prevention of Genocide Monday. Opening the conference in the Swedish capital, Persson also noted the weak reaction of the international community to ethnic cleansing in former Yugoslavia and the "paralysis" of the rest of the world in the face of genocide in Rwanda. Some 50 countries are participating in the international meet. Egypt and Morocco are the only two Arab states attending.Persson quoted from the diaries of Rafael Lemkin, the Polish Jewish lawyer who fled to Sweden during the Holocaust, and who coined the term "genocide" when he appeared at the Nuremberg Trials after World War II. The prime minister thanked two prominent Holocaust scholars for attending the conference - Prof. Yehuda Bauer of Yad Vashem and Nobel Prize-winner Eli Wiesel.UN Secretary-General Kofi Annan, who spoke next, decried the role of the Security Council in preventing the atrocities in Srebernice in 1995 and Rwanda in 1994, saying that instead of beefing up the UN troops at the site, it had ordered them to retreat. Annan said also that he had not received sufficient international support to implement the recommendations of the commissions of inquiry that looked into the two massacres. He proposed setting up a special mechanism for the prevention of genocide in the future. The Swedish organizers then gave the honor of the next speech to Bauer, who served as academic advisor to the conference. Bauer responded to criticism that present-day conflicts, such as that between Israel and the Palestinians, were not being discussed by the forum. He said the intention of the organizers was to be forward-looking and to leave issues "such as Iraq, Kashmir and the Middle East" to other forums. "There will be no decisions made here and no agreements will be drawn up," Bauer said. He warned that radical Islam could constitute "a threat to all civilization" and said it must be battled by "a combination of strength and other means." Nimrod Barkan of the Foreign Ministry's Diaspora division, who is heading the Israeli delegation, read out to the forum quotes from sermons delivered by Muslim clerics in Mecca against the Jews. The suicide bombers get their inspiration from them, Barkan said, and they will harm not only Jews but others also.Swedish members of the left-wing Anti-War Coalition Monday held a rally near the conference hall. They were protesting against what they saw as the failure of the participants in the forum to discuss the situation of ethnic minorities which, they said, are being threatened by genocide: the Palestinians in the territories, the Chechans, the Turkish Kurds and the trade unions in Colombia. The previous night, the protesters had held an "alternative" forum to which they invited members of these groups. The Palestinians were represented by Mohammed Bakri, who made the film "Jenin, Jenin." Only a few dozen protesters gathered at the rally, which was held in a central square in Stockholm, about 10 minutes' walk from the international forum. The organizers attributed this to the bitter cold. Prominent among the demonstrators were Palestinians and pro-Palestinian activists who set up a wooden wall along the edge of the square, to represent the separation fence. The rally began with controversial ex-Israeli artist and musician Dror Feiler playing his saxophone. He chose a song by Umm Kultum, followed by his own interpretation of a Jewish prayer, and then spoke in Swedish, calling on the protesters to boycott American produce and Israeli goods manufactured in the territories. Other speakers charged Israel with genocide against the Palestinians. Feiler told Haaretz that he was negotiating the exhibition of his suicide-bomber exhibit with a number of museums in Europe and elsewhere. The exhibit received vast publicity after Israel's ambassador to Sweden tore down the lights around it. Feiler said that the fact that the media were more interested in him "than in the crimes being perpetrated in the territories" showed how warped the public agenda is. He said, however, that he was very pleased with the personal attention he had received. "I was interviewed on CNN for seven whole minutes," he said. "It was all due to the ambassador." STOCKHOLM: Thirteen countries in the world face the threat of genocide  Iraq, Afghanistan, eight nations in African and three in Asia , a US researcher told an international conference on preventing genocide Tuesday. Sudan, Myanmar, Burundi, Rwanda and the Democratic Republic of Congo (DRC) are in greatest danger of mass bloodshed, Barbara Harff of the US Center for International Development and Conflict Management, told the conference in Stockholm. The other eight countries on the danger list are Somalia, Uganda, Algeria, China, Iraq  despite the US-led regime change , Afghanistan, Pakistan and Ethiopia. Sudan, Myanmar, Burundi, Rwanda and the DRC all meet five of the six risk factors outlined by Harff who, at the Clinton administrations request, designed in the 1990s a theoretical model for risk assessment and early warning of genocidal violence. The factors are prior genocides or politicides; upheaval since 1988; existence of a minority elite; exclusionary ideology; the type of regime and trade openness. Somalia, Uganda, Algeria and China meet four of the six factors, while Iraq, Afghanistan, Pakistan and Ethiopia meet three, Harff said in a presentation of her November 2003 report to representatives from 50 countries attending the Stockholm conference. Harff said that with her model we can narrow the timeframe and identify warning flags that a genocide is in the making a few months prior to its onset. Harffs remarks came during discussions on the early warning signs of genocide, on the second day of the three-day conference. The secretary general of the International Committee of the Red Cross told delegates that speedy responses were crucial in preventing a repeat of the World War II Holocaust and the massacres in Yugoslavia and Rwanda in the mid-1990s. It is difficult to anticipate the critical moment at which genocide will begin or the scope that the massacre will take. Greater efforts must therefore be made to interpret the warning signs and respond to them adequately, Jakob Kellenberger said. This should not be too difficult. Alarm bells ring for those who are listening.The problem, he said, was that there was a lack of will to act and he urged politicians, representatives of civil society and the business sector to work together to promote dialogue, mutual understanding and trust. His comments echoed those of United Nations Secretary General Kofi Annan, who told the conference Monday that the slaughter in Yugoslavia and Rwanda could have been prevented if the world had taken action. The events of the 1990s, in the former Yugoslavia and in Rwanda, are especially shameful. The international community clearly had the capacity to prevent these events. But it lacked the will, Annan said. Annan recommended the creation of a Committee on the Prevention of Genocide and the introduction of a special rapporteur on preventing genocide, who would report directly to the UN Security Council, the UNs top decision-making body. As the world marked Holocaust Memorial Day on Tuesday, Swedens Jewish community was to host a remembrance ceremony at Stockholms synagogue, to which the heads of conference delegations were invited and at which the Swedish prime minister was to deliver an address.The Preventing Genocide conference is the first major inter-governmental forum on genocide since the adoption of the UN Convention on the Prevention and Punishment of the Crime of Genocide in 1948, according to organizers.The meeting is scheduled to conclude Wednesday, when delegates are to adopt a declaration that should serve as a political basis for future discussions on preventing genocide. The 50 countries at the conference were also due to approve a document committing themselves to providing shelter to people threatened by genocide. President Moisiu participates in the International Forum in Stockholm. Alfred Moisiu The President of the Republic Mr.Alfred Moisiu departed yesterday to Sweden to participate in the International Forum 2004 in Stockholm "Genocides prevention: The threatening and responsibilities". President Moisiu is expected to speak in front of other government leaders, political leaders, academics and representatives of civil society organizations. The publicist Fatos Lubonja and the historian Luan Malltezi will also be part of the delegation led by Mr. Moisiu. Over the course of the Forum, January 26-28, the President will have bilateral meetings with his colleagues and other persons. Soon after his return home, President Moisiu will travel to the USA where he will participate in the prayer breakfast, an activity that is held every year in this country. Like the previous years he will be accompanied on this important activity by Albanian politicians from all over the political spectrum. STOCKHOLM : Speedy responses to early warning signals are key to preventing a repeat of the World War II Holocaust and the massacres in Yugoslavia and Rwanda in the 1990s, an international conference on genocide prevention was told. "It is difficult to anticipate the critical moment at which genocide will begin or the scope that the massacre will take. Greater efforts must therefore be made to interpret the warning signs and respond to them adequately," Jakob Kellenberger, secretary-general of the International Committee of the Red Cross, told representatives of more than 50 countries. "This should not be too difficult," he said Tuesday. "Alarm bells ring for those who are listening. "The problem, he said, was that there was a "lack of will to act", and urged politicians, representatives of civil society and the business sector to work together to promote dialogue, mutual understanding and trust. His comments echoed those of UN Secretary General Kofi Annan, who told the conference on its opening day Monday that the slaughters that occurred in Yugoslavia and Rwanda could have been prevented if the world had taken action. "The events of the 1990s, in the former Yugoslavia and in Rwanda, are especially shameful. The international community clearly had the capacity to prevent these events. But it lacked the will," Annan said. Annan recommended the creation of a "Committee on the Prevention of Genocide" and of the post of special rapporteur on the prevention of genocide, who would report directly to the UN Security Council, the UN's top decision-making body. "I long for the day when we can say with confidence that, confronted with a new Rwanda or a new Srebrenica, the world would respond effectively, and in good time. But let us not delude ourselves, that day has not yet come," he said. On Tuesday, as the world marked Holocaust Memorial Day, delegates attending the conference listened to panel discussions and attended workshops addressing issues such as early warning signals, responsibility for prevention of ethnic cleansing, how to strengthen the United Nations, as well as deterrents, responses and how to deal with the aftermath. Meanwhile, Sweden's Jewish community was to host a Holocaust remembrance ceremony on Tuesday evening at Stockholm's synagogue, to which the heads of delegations were invited and where Swedish Prime Minister Goeran Persson was to make an address. The Preventing Genocide conference, the brainchild of the Swedish leader, is the first major inter-governmental forum on genocide since the adoption of the UN Convention on the Prevention and Punishment of the Crime of Genocide in 1948, according to organisers. The meeting is scheduled to conclude on Wednesday, when delegates are to adopt a declaration that should serve as a political basis for future discussions on preventing genocide, conference chairman Paer Nuder, Swedish policy coordination minister, said.The 50 countries at the conference were also due to approve a document committing themselves to providing shelter to people threatened by genocide. STOCKHOLM, Jan. 27  The International Criminal Court hopes to begin its first investigation  an examination of war crimes accusations in northeast Congo  by October, its chief prosecutor said Tuesday. The prosecutor, Luis Moreno-Ocampo, said continuing violence in the region made it difficult to begin the investigation earlier because potential witnesses could be killed. "The idea is that we start in October because then we can be sure we have stopped the violence and we can go there and talk to people," he said at an international antigenocide conference in Sweden. The court, which has no formal cases on its books yet, was set up in The Hague to try suspects for genocide, war crimes and systematic human rights abuses. Ethnic clashes between rival Hema and Lendu militias in the northeastern province of Ituri have claimed more than 50,000 lives since 1999. Mr. Moreno-Ocampo said that trials would probably begin next year and that the court could only investigate crimes that took place after July 2002, when it came into force. STOCKHOLM, Sweden (AP) -- Sweden's prime minister has been bombarded with about 14,000 e-mails from a U.S.-based Jewish human rights group protesting an art exhibit featuring the image of a Palestinian suicide bomber, the government said Tuesday. The flap threatened to overshadow a three-day international conference in Stockholm on preventing genocide that ends Wednesday. Israel downgraded its representation at the conference after the Museum of National Antiquities refused to remove a display showing a picture of Islamic Jihad bomber Hanadi Jaradat, who killed herself and 21 bystanders in an Oct. 4 suicide attack in Haifa, Israel. The Los Angeles-based Simon Wiesenthal Center said the exhibit glorified a ``Palestinian homicide bomber'' and Sweden should declare suicide bombings a crime against humanity. In a letter posted on its Web site last week, the center said Sweden has championed the exhibit under the rubric of artistic freedom. ``But what is Sweden prepared to do for the real victims of terror? No nation has yet had the courage to officially come forward to declare suicide bombing 'a crime against humanity,''' the letter said.Prime Minister Goeran Persson described the protest e-mails as similar to letter campaigns organized by lobby groups. ``We are subject to this kind of mail bombardment every now and then, but I can't say that it's very effective as a way of voicing an opinion,'' Persson said, describing the letters as ``not very threatening.'' Foreign Minister Laila Freivalds said the government does not have the right to censure art.``The government can't influence the museum in its actions, but it's the museum itself that decides what will be shown or not,'' she said. ``We have freedom of expression, and our departments and museums are independent.'' Israeli-born artist Dror Feiler, who created ``Snow White and the Madness of Truth,'' said the piece was meant to call attention to how weak, lonely people can be capable of horrible things. Israeli Ambassador Zvi Mazel tried Jan. 16 to vandalize the display, which is in a rectangular pool filled with red-colored water. Museum officials rejected Mazel's calls to remove the exhibit but said they would take down 26 posters with Jaradat's face that were placed in Stockholm subway stations to advertise the exhibition.But Israel lowered its representation at the genocide conference as a result of the flap, sending a diplomat instead of Israeli President Moshe Katzav.On Tuesday, Persson attended a candlelight ceremony for Holocaust victims in downtown's Raoul Wallenberg Square.``This is a possibility to reflect on how cruel people can be to each other,'' Persson said.``The Holocaust wasn't the end of genocide. I just have to mention Rwanda, I just have to mention Srebrenica. In our time, we are not exempt from attacks against the values of humanity. ''Persson also attended a Holocaust memorial service amid tight security at the Stockholm synagogue. STOCKHOLM (Reuters) - The United States will release up to two dozen prisoners it considers to be a low security threat from its Guantanamo Bay military base, says the U.S. special ambassador for war crimes. Ambassador Pierre-Richard Prosper said arrangements were underway but did not want to say what nationalities the prisoners were or when they would be released. "We have made agreements with these countries that we wait for them to do the announcements," Prosper told journalists on the sidelines of a Swedish conference on preventing genocide. "It is not only about transport, we are also trying to see if we can meet the desires of the particular detainees of where they go and when they go," he said. Around 660 suspected Taliban and al Qaeda members have been held at the Guantanamo Bay camp in Cuba since they were captured during the U.S.-led war in Afghanistan, which began after the September 11, 2001 attacks on the United States. Prosper said about 80 deemed no threat to security were released last year. The detentions without trial have drawn worldwide criticism from governments and human rights groups concerned about the prisoners' legal status and the conditions in the camp. Prosper said the prisoners to be released were of low or no security threat. He said the United States was also in talks with several countries on sending home prisoners thought to be a medium threat, but could not say when that would happen. "The issue is not in our hands, at this moment it is with the other governments. If they come back tomorrow it would be tomorrow," he said.But Prosper also said many prisoners needed further investigation. "In particular to the European detainees, there is a pattern developing on what countries they visited on their way to Afghanistan, a disturbing pattern... which is beyond coincidence," he said.  The inter-ethnic conflict in Kosovo provides good lessons about both the successes and pitfalls of international action in halting ethnic cleansing and preventing it from occurring again, a senior United Nations official told a conference on genocide today. These include the need to establish a peacekeeping presence as soon as possible in the area of conflict to prevent retaliation and the difficulty of ensuring the return of all refugees, Secretary-General Kofi Annan's Deputy Special Representative in Kosovo, Jean-Christian Cady, told the Stockholm International Forum on preventing genocide. Kosovo is a good example of what the international community and the United Nations can achieve to stop ethnic cleansing and build policy instruments that will prevent it from occurring again, Mr. Cady said of the province that has been under UN administration since June 1999 following fighting between Serbs and ethnic Albanians. He stressed that prerequisites included a clear and common will of the international community to stop an ethnic cleansing as well as the deployment as soon as possible of an international mission with a military component and a robust mandate.One of the shortcomings we had in Kosovo was that during the time it took to establish the full peacekeeping presence, in the summer and autumn of 1999, numerous interethnic retaliation actions took place and the victims became the perpetrators, he said.The second difficulty is the return of refugees. In Kosovo practically all ethnic Albanians went back in a matter of weeks, but more than four years later most Serbs who fled have not returned despite the efforts of the UN Mission in Kosovo (UNMIK).Even though some of them do return, many Serbs feel that the interethnic security situation is too fragile and the unemployment too high, to allow them to settle again in Kosovo, Mr. Cady said. Before reconciliation can occur, effective justice must be delivered, so that no crime is left unpunished, whoever the victim or perpetrator, he added. The main challenge of UNMIK is to create stable conditions for a multiethnic Kosovo, not only to prevent ethnic cleansing from occurring again when the mandate of the international mission comes to an end but also to ensure a normal development and prosperity of all communities, free from harassment and with equal access to institutions, an impartial police and justice system, he declared. are affected or risk being victims of genocide or ethnic cleansing," the paper notes. "The Russian Government is invited, but not the Chechen people. Turkey, but no Kurdish organisations. No Romany representatives, even though they shared the same fate as the Jews during the Holocaust." Malmoe's Sydsvenska Dagbladet points out that the Stockholm International Forum is being held because today is the 59th anniversary of the liberation of Auschwitz and asks: "Could it happen again?" In Denmark too, Copenhagen's Kristeligt Dagblad notes what it calls "an almost explosive rise" in the number of attacks on Jews, synagogues, Jewish cemeteries and other Jewish symbols in Europe. "There is a tendency, particularly among Israel's populist politicians, to see anti-Semitism everywhere, but not all criticism of Israel is anti-Semitism," the paper says. "The fact that at least seven European countries are today holding days of remembrance for the Holocaust is a sign that Europe has not forgotten what happened 60 years ago. BBC Monitoring, based in Caversham in southern England, selects and translates information from radio, television, press, news agencies and the Internet from 150 countries in more than 70 languages. STOCKHOLM, Sweden, JAN. 28, 2004 (Zenit.org).- The Holy See called on the international community to examine why its efforts to prevent new genocides in recent times have failed. The appeal was made by Archbishop Celestino Migliore, permanent observer of the Holy See to the United Nations, when, as head of the Vatican delegation, he delivered an address Tuesday to the 4th Stockholm International Forum on "Preventing Genocide: Threats and Responsibilities." Archbishop Migliore defined genocide as the "specific intent to destroy, in whole or in part, a nation, a race, an ethnic or religious group, a defenseless or vulnerable group of human beings, simply for being such. Indeed, genocide literally means to kill a race or a tribe." Inaugurating the forum, U.N. Secretary-General Kofi Annan said the international community witnessed in the 1990s the "shameful" genocide in Rwanda and in former Yugoslavia. Archbishop Migliore noted that, although the international community has adopted juridical instruments, these "have not prevented new genocides from happening." "Something must have gone wrong, and the international community is duty-bound to examine why they failed," the archbishop said. It is important, he added, "to determine whether the failure was due to instruments and structures which have become wanting in the face of evolving criminal strategies, or to a lack of political will to implement them, or to interests overriding the survival of a nation or a group, or to all these factors combined." "This task is all the more compelling if we consider that, since genocide's intent to destroy a nation or a group implies coordinated planning and long-term strategy, signs of an impending threat could hardly escape notice of an attentive international community," Archbishop Migliore added. "The United Nations and other international organizations have the task to muster international resolve to implement, whenever and wherever is necessary, the juridical instruments and structures," he said. "They are the privileged fora in the search for refocusing these instruments and structures and, if need be, in creating new ones, to make them more responsive to threats of genocide or other grave violations of human rights." Archbishop Migliore underlined the "duty to educate individuals and communities, not only on the horrors of genocide, not only to oppose it, but above all, to prevent it from occurring again." "Genocide remains, unfortunately, a constant menace in some regions of the world, where its causes and telltale signs may not be so hard to identify," the Holy See representative said. "Genocide is latent in places where eliminating the other is considered a fast solution to drawn-out rivalries and unresolved conflicts; where blatantly unjust relations between groups are ideologically justified; where under the surface of apparent order are embers of hatred still burning for lack of mutual forgiveness and reconciliation; where acceptance of past mistakes and a 'purification of memory' are obstructed by the fear to confront the historical reality," he added. "These are not only identifiable warnings of an impending threat of genocide," the prelate said. "If I may add, these are also identifiable factors in the breeding grounds of terrorism." In the forum, Israeli professor Yehuda Bauer, academic adviser of the conference and of the Yad Vashem Institute in Jerusalem, said that genocide was the cause of 169 million deaths between 1900 and 1987. A risk of genocide currently exists in Burma, Sudan, Burundi, Rwanda and in Kinshasa, the capital of Congo, Bauer said. Representatives of more than 60 governments and international organizations participated in the forum, invited by Swedish Prime Minister Goran Persson. The three-day forum ended today. Mr. Chairman, On behalf of my Delegation, I wish to congratulate sincerely the Swedish Government for organizing this Forum on preventing genocide. The Forum's emphasis on prevention and on identifying threats of genocide makes it a most fitting conclusion to the three previous ones: on the Holocaust, on Combating Intolerance, and on Truth, Justice and Reconciliation. -- third, the commitment to education and vigilance against genocide. 1. First, the need to implement instruments and structures against genocide. In response to the tragic cases of genocides of the last century, the international community developed a series of legal instruments and juridical structures -- from the Convention for the Prevention and the Punishment of the Crime of Genocide, approved by the United Nations in 1948, to the creation of the International Criminal Court, approved in Rome in 1998. However, facts attest that the existence of these instruments and structures have not prevented new genocides from happening. Something must have gone wrong, and the international community is duty-bound to examine why they failed; to determine whether the failure was due to instruments and structures which have become wanting in the face of evolving criminal strategies, or due to a lack of political will to implement them, or due to interests overriding the survival of a nation or a group, or due to all these factors combined. This task is all the more compelling if we consider that, since genocide's intent to destroy a nation or a group implies coordinated planning and long-term strategy, signs of an impending threat could hardly escape notice of an attentive international community. 2. Second, the role of the international organizations. The United Nations and other international organizations have the task to muster international resolve to implement, whenever and wherever is necessary, the juridical instruments and structures. They are the privileged fora in the search for refocusing these instruments and structures and, if need be, in creating new ones, to make them more responsive to threats of genocide or other grave violations of human rights. In this regard, the United Nations remains the central forum for global international rule making. In the last decades, a substantial body of international treaties was negotiated in the UN. This work still continues on this very day. And we observe that a gradually expanding corpus of international law imposes obligations on member States. However, not all member States, in particular developing countries, have the technical capacity to cope with all the international obligations. There is a growing rift between the development of international law and the capability of countries to apply it. Here implementation is a key word in the challenges ahead of us in international law; it stresses the importance of juridical, technical assistance to developing countries. 3. The third and final point my delegation wishes to underscore is our duty to educate individuals and communities, not only on the horrors of genocide, not only to oppose it, but above all, to prevent it from occurring again. A lot has already been learned about genocide. But educating all about its evil is a perennial and ever-timely duty incumbent upon us all. It was in this sense, for example, the U.N. General Assembly unanimously adopted resolution 58/234, on 23 December 2003, designating 7 of April this year as the International Day of Reflection to commemorate the victims of the 1994 genocide in Rwanda. Genocide remains, unfortunately, a constant menace in some regions of the world, where its causes and telltale signs may not be so hard to identify. Genocide is latent in places where eliminating the other is considered a "fast solution" to drawn-out rivalries and unresolved conflicts; where blatantly unjust relations between groups are ideologically justified; where under the surface of apparent order are embers of hatred still burning for lack of mutual forgiveness and reconciliation; where acceptance of past mistakes and a "purification of memory" are obstructed by the fear to confront the historical reality. These are not only identifiable warnings of an impending threat of genocide: if I may add, these are also identifiable factors in the breeding grounds of terrorism. Mr. Chairman, The world has become too interconnected to plead ignorance on what is happening on the other side of the global village and, to a large extent, the legal instruments and juridical structures are already in place to nip genocides in the bud. What we need most now is a greater and more courageous will to implement them. Thank you, Mr. Chairman. Delegates at an international summit on preventing genocide have vowed to stop any repetition of the mass killings seen in World War II. They also committed themselves to identifying and using ways to monitor areas at risk to halt ethnic cleansing on the scale of the Holocaust. The declaration by representatives from 50 nations follows three days of talks. The meeting in the Swedish capital, Stockholm, discussed the 1948 United Nations resolution on genocide. Responsibilities The delegates said they would use new ways of monitoring to "prevent the recurrence of genocide, mass murder and ethnic cleansing".The delegates also agreed to shoulder their responsibility "to protect groups identified as potential victims of genocide, drawing upon the range of tools at our disposal to prevent such atrocities." They said they bore in mind the Holocaust engineered by Adolf Hitler in which millions of Jews were killed and other groups such as gypsies and homosexuals were also targeted for extermination.The representatives said they would also consider a proposal by UN Secretary General Kofi Annan calling for the creation of a special rapporteur and a committee for the prevention of genocide. Mr Annan told the conference that genocides in Yugoslavia and Rwanda could have been prevented if the world had taken action. East Timor President Xanana Gusmao referred to events in his own country and called for those who perpetuate genocide to be brought to justice.However the International Criminal Court, seen by some as a promising tool in the fight against genocide, was not mentioned in the final declaration.Diplomatic sources at the conference said the reference to the court was left out after opposition from the United States and Israel.Nonetheless, the declaration was hailed as the most powerful in condemning ethnic cleansing and mass killings since the 1948 UN resolution on genocide. STOCKHOLM, Jan. 28 (Xinhuanet) -- The three-day conference against genocide wrapped up on Wednesday with a declaration calling for collective efforts of the international community to prevent genocide, ethnic cleansing and mass killings. Every member of the international community is obliged to take effective measures and establish mechanisms to identify and report possible threats of genocide in order to prevent the recurrence of the tragedy of mass killings, said the declaration. The international community should cooperate with each other under the guidance of the United Nations and other relevant regional and international organizations to implement effective measures to eliminate threats of genocide, it added. All nations of the world have the duty to protect the community under genocide threats, assist the survivors in rebuilding their homes and bring the culprits to justice. The declaration also called for more attentions and efforts on the education of the young people and the public. UN Secretary-General Kofi Annan as well as some ten heads of state or government attended the conference and delivered speeches. Many delegates believed the international community lacks a political will rather than the resources and capability in protecting the human beings from the danger of mass killings. Annan called on the whole world to come up with effective methods in preventing the tragedy and suggested the establishment of special international organizations. Javier Solana, EU High Representative for common foreign and security policy pledged larger responsibility of the European Union in preventing genocide in West Balkan and the Great Lakes area in Africa. The event was the first major international conference on this subject since the United Nations adopted its Convention Against Genocide in 1948. Stockholm, Jan. 28--(AP) Fifty-five countries signed a declaration Wednesday to fight genocide and ethnic cleansing, but left out any mention of the International Criminal Court because of U.S. objections. An overwhelming majority of delegates at the three-day conference in Stockholm on preventing genocide backed the ICC, but had no hopes of reversing staunch U.S. opposition to the court, Swedish Prime Minister Goeran Persson said. After the conference ended Wednesday, Persson told reporters he was disappointed in the U.S. stance. However, he conceded that to believe an "international conference in Stockholm suddenly will reverse (U.S. President) George Bush's foreign policy in the beginning of an electoral campaign, that's not very realistic. "The 1998 Rome Statute establishing the ICC has been ratified by 90 countries, but the court faces opposition from the United States. Bush administration officials fear that Americans, particularly soldiers abroad, could fall victim to politically motivated prosecutions. The head of the U.S. delegation to the conference, ambassador-at-large for war crimes issues, Pierre-Richard Prosper, said he did not pressure other delegates to leave out the ICC from the declaration. "There was no pressure," Prosper told reporters. "The reason was that they wanted to reach a consensus and clearly we could not join consensus on welcoming the establishment of the ICC." He added the United States was committed to working with other countries in bringing to justice those responsible for genocide. Persson criticized the U.S. position, citing the progress made by U.N.-sponsored war crimes tribunals set up to prosecute former Yugoslav President Slobodan Milosevic and leaders of the 1994 mass slaughter of civilians in Rwanda. "There is reason to also create something that is permanent, that goes beyond these two special cases," he said. "I think it's surprising that this opinion hasn't won in the USA." In their declaration, delegates committed to "develop practical tools and mechanisms" to quickly identify genocidal threats. The declaration, which isn't legally binding, also called for signatories to "educate youth and the wider public" about the dangers of genocide. Delegates also welcomed U.N. Secretary-General Kofi Annan's proposal to set up a U.N. committee and a "special rapporteur" to monitor violations of human rights and threats to international peace and security. The conference was the fourth and final in a series of annual conventions called the Stockholm International Forum, which began with a conference on the Holocaust in 2000. Roughly 1,000 delegates attended, including a dozen heads of state or government, to discuss how to deal with threats of coming genocide, mass killings or ethnic cleansing. European Union foreign policy chief Javier Solana said military intervention was not the best way to prevent genocide and should only be used as a last resort. "Sometimes you have to stop a situation that is dramatic if you cannot do it with economic measures or nice words," Solana said. "But we have to be very clear that prevention is not military." Delegates at the "Preventing Genocide" conference in Stockholm this Wednesday were expected to issue the most powerful document ever condemning mass killing. But US opposition to recognising ICC authority - widely considered the most promising new tools in the fight against genocide - will make any declaration less effective, according to delegates. The final draft, to be immediately adopted through consensus by 50 countries, deals with all aspects of "ethnic cleansing" and goes further than the 1948 UN Convention on the Prevention and Punishment of the Crime of Genocide. International justice The conference secretary general, Krister Kumlin, told journalists that: "We're talking about a consensus document here, and that means everyone has to agree. "Both the US and Europe agree that it's important to bring perpetrators to justice. The disagreement is about what tool to use. "The conflict is obviously there. It's very sad, not least because it was the United States that once took the initiative to create the ICC," he added. But Washington fears the court could become a forum for politically motivated prosecutions of US citizens, especially soldiers deployed abroad. The White House has waged an international campaign to sign immunity from prosecution pacts with various countries after the World Court came into being in 2002. Representatives of about 50 countries have concluded a three-day conference in Stockholm on genocide with a declaration pledging to avoid future holocausts. The delegates vowed to use and develop all tools and mechanisms to identify, monitor, report and prevent future instances of mass murder and ethnic cleansing around the world. They also agreed to consider proposals by United Nations Secretary General Kofi Annan to create a U.N. Committee on the Prevention of Genocide and for naming a special U.N. official who would report on efforts to prevent genocide. But the conference's final declaration did not include language supporting the creation of a permanent International Criminal Court. Observers said opposition by the United States blocked the proposal. The Bush administration opposes the permanent court, saying it could become a forum for politically-motivated prosecutions of U.S. citizens abroad. The United States signed a U.N. treaty creating International Criminal Court in 2000, during the Clinton administration, but withdrew its signature two years later.The meeting was the last of four annual conferences held in the so-called Stockholm International Forum. The Forum was created in 2000 to discuss ways to avoid future Holocausts.Some information for this report provided by AP and AFP. Fifty-five countries have signed a declaration to fight genocide and ethnic cleansing, but left out any mention of the International Criminal Court because of US objections. An overwhelming majority of delegates at the three-day conference in Stockholm on preventing genocide backed the ICC, but had no hopes of reversing staunch US opposition to the court, Swedish Prime Minister Goeran Persson said.After the conference, Persson told reporters he was disappointed by the US stance. However, he conceded that to believe an "international conference in Stockholm suddenly will reverse (US President) George Bush's foreign policy in the beginning of an electoral campaign, that's not very realistic." The 1998 Rome Statute establishing the ICC has been ratified by 90 countries, but the court faces opposition from the United States. Bush administration officials fear that Americans, particularly soldiers abroad, could fall victim to politically motivated prosecutions.The head of the US delegation to the conference, ambassador-at-large for war crimes issues, Pierre-Richard Prosper, said he did not pressure other delegates to leave out the ICC from the declaration. "There was no pressure," Prosper told reporters. "The reason was that they wanted to reach a consensus and clearly we could not join consensus on welcoming the establishment of the ICC. "Persson criticised the US position, citing the progress made by UN-sponsored war crimes tribunals set up to prosecute former Yugoslav President Slobodan Milosevic and leaders of the 1994 mass slaughter of civilians in Rwanda. "There is reason to also create something that is permanent, that goes beyond these two special cases," he said. "I think it's surprising that this opinion hasn't won in the USA." Persson also said that the future credibility of the United Nations Security Council will depend on India being offered a permanent seat "Is it possible to have in the future a credible multilateral organisation carrying the whole globe, without, for instance, letting in the biggest country according to population, at least soon, India?," Persson asked. "Is that possible? Of course not." STOCKHOLM (AFP) - EU foreign policy chief Javier Solana defended the 1999 NATO bombing campaign in Yugoslavia yesterday, saying it was necessary to protect ethnic Albanians in Kosovo. Sometimes you have to stop a situation, and if you cannot stop it with words, then you have to stop it with force, Solana, in Stockholm for an international conference on genocide, told journalists. I think we did the right thing. If you look at conditions at the time, I think everyone would have done the same thing, said Solana, who was NATO secretary-general at the time of the campaign. There can be no more important issue, and no more binding obligation, than the prevention of genocide." So said United Nations Secretary-General Kofi Annan at the Stockholm International forum on Monday. He went on to remind delegates that shortly after World War I, when the words "never again" were spoken by everyone, the UN General assembly adopted the Convention on the Prevention and Punishment of the Crime of Genocide in 1948, which entered into force three years later. Currently, some 130 states are now parties to that agreement. So, with an international law in force for over 50 years, it would be reasonable to think no genocide or atrocities had occurred in that time, since "the world cared" and was prepared to action accordingly. But that is far from the truth: There have been numerous atrocities around the world in that time. In recent memory is Yugoslavia and Rwanda, where the UN failed spectacularly. Earlier was Cambodia and Vietnam. Presently there is Nepal and Burma. Also various African nations are suffering the effects of genocide because of disease and want; there are probably other nations where ethnic cleansing is taking place but, as yet, the fact has failed to get public attention. To counter these continual atrocities that arise from time to time globally, Annan has suggested that the signatories to the Genocide Convention form a special committee to review reports and recommend action. To ensure that the UN Security Council is kept alert to these crimes, Annan also proposes the appointment of a special rapporteur to make early reports to the Council. Annan also suggests that in extreme cases military force be used pre-emptively to stall any perceived crimes. Such recommendations are sound, but it will require a very different attitude on the part of UN members, who prefer to diplomatically and bureaucratically cogitate, while people are massacred, rather than take action. Gulf News is the leading English language newspaper of the United Arab Emirates and takes pride in its solid coverage of the Gulf region. YEREVAN. (YERKIR). - Armenian Prime Minister Andranik Margarian met on Wednesday with his Swedish counterpart Goran Persson, who praised Margarian's speech at the Genocide Prevention forum as impressive, and welcomed Margarian's proposal to declare 2005 a year of fighting against genocides. The Swedish prime minister conveyed hope that Turkey would react to the positive message sent by Armenia and would open its border, and the two countries would find common grounds for cooperation. "Turkey is on the road to join the European Union, and joining the EU also means marinating friendly relations with neighbors," Persson was quoted as saying. During their meeting, Prime Minister Margarian invited the Swedish prime minister to participate in an international conference marking the 90th anniversary of the Armenian Genocide, to be held in Yerevan in 2005. TURKEY'S RECOGNITION OF ARMENIAN GENOCIDE WOULD TAKE IT A STEP FORWARD TO DEMOCRACY STOCKHOLM, JANUARY 29, ARMENPRESS: Ucel Acer from the Turkish delegation to the Stockholm International Forum on Preventing Genocide; Threats and Responsibilities, who is also an expert in international law at Turkish Bogac University, told Armenpress that establishing of an international day to commemorate genocide victims would be an effective measure in the overall efforts aimed at preventing the repetition of such crimes in future. Speaking to Armenpress correspondent on the sidelines of the conference, the Turkish experts said that setting a genocide commemoration day would also help raise the general awareness of peoples of that crime. Asked to share his views on a suggestion by Armenian prime minister Andranik Margarian at the Forum to declare the year of 2005 the year of struggle against violation of human rights, and commemoration of the victims of wars and genocides, Ucel Acer said: "I do not think that the year of 2005 has anything to do with what happened in 1915 (in 2005 the 90-th anniversary of the Armenian Genocide will be marked)." According to him, Armenians and Turks have to seek for establishment of good neighborly relations, but look into the past, as Armenians in Diaspora, who he said fail to realize the importance of normal relations between Turkey and Armenia. "They are talking about the facts of the past, but we have to look in future," he said, adding that constant accusations on both sides are just adding to the hatred. The Turkish professor also downplayed the possible effect of his government's official recognition of the genocide to diffuse the political atmosphere of the region and open new avenues of cooperation. Another participant of the conference, Payam Akhavan, a former member of the international court in the Hague, said, when speaking to Armenpress that the failure of governments to condemn the Armenian genocide led to the systematic annihilation of Jews by the nazi Germany "By acknowledging the 1915 genocide Turkey would make a step forward to democracy and get rid of its burden of past ," he said. STOCKHOLM, Jan 30 (IPS) - The first intergovernmental conference on genocide to be held since 1948 ended this week in Stockholm with political fireworks within the conference hall marking its finish. Before representatives from 55 nations, former Australian foreign minister Gareth Evans said U.S. officials had been using the conference to lobby against the International Criminal Court (ICC), the very body created to try crimes against humanity like genocide. The United States has withdrawn from the Rome Treaty of 1998 that created the ICC. "I'm distressed to hear that the same old squeeze has been put on the national delegations all over again at this conference," Evans said. "And in the otherwise admirable declaration we have emerging from it there is no mention of the International Criminal Court...this is just indefensible." Evans continued to berate the Bush administration for blocking global efforts to create such accountability structures. His remarks were greeted with thunderous ovation. The dramatic intervention highlighted the challenge before the Stockholm International Forum 2004, as the conference was called. The meeting Jan. 26- 28 drew political leaders, officials, academics and members of non- governmental organisations. The Swedish government hosted the conference. On the one hand United Nations Secretary-General Kofi Annan drew support for his proposal to set up a committee on the prevention of genocide. On the other, delegates saw just what could be preventing the prevention of genocide. Annan pointed to tragedies spawned by a lack of political will. He said there had been deliberate efforts to mislabel genocide, and that some states "even refused to call it by its name, to avoid fulfilling their obligations." Annan said a special rapporteur should be created along with the committee on the prevention of genocide, the rapporteur reporting "directly to the Security Council." Genocide is a threat that must be addressed with "strong and united political action and, in extreme cases, by military action," he said. But cutting to the crux of the issue, Annan asked: "The question is, do we have the will?" Secretary-general of the International Committee of the Red Cross Jakob Kellenberger also saw a "lack of will to act." The U.S.-based Human Rights Watch (HRW) endorsed Annan's proposal. It said a key facet of the initiative is that no one "would be able to say they didn't know." Describing the slaughter of between 800,000 and a million people in Rwanda in 1994, Annan said "a lack of resources and a lack of will to take on the commitment which would have been necessary" created conditions for the disaster. "Instead of reinforcing our troops, we withdrew them," Annan said. "The gravest mistakes were made by member states, particularly in the way decisions were taken in the Security Council." While Annan and others spoke of the "responsibility" of humanitarian intervention, a current of concern ran through this. Annan emphasised the imperative for "clear ground rules to distinguish between genuine threats of genocide, which require a military solution, and other situations where force would not be legitimate." In the light of such concerns, the conference debated whether terrorism and weapons of mass destruction were 'genocidal' threats, casting the shadow of the war on terror over discussions. 'Genocide; a background paper' commissioned by the Swedish Government from Sweden's Lund University raised further questions. The paper asked if "the very structure of modern bureaucratic society is the root cause of the genocidal impulse." The paper paralleled questions examined by U.S. political scientist and philosopher Hannah Arendt in her book 'Eichmann in Jerusalem: A Report on the Banality of Evil' (Adolf Eichmann was a Nazi colonel executed for transporting countless Jews to extermination camps). The authors of the Lund university paper, professors of history Kristian Gerner and Klas-Göran Karlsson, examined how a "pliant bureaucracy" equipped with administrative and weapons technology can come to "solve what were seen as acute political and social problems by murdering human beings on a mass scale." Gerner and Karlsson noted such developments in Rwanda. They also pointed out that after Vietnam invaded Cambodia, ending the 1975-1979 genocide which claimed more than 1.6 million lives, the "United Nations, the United States and China continued to recognise the Khmer Rouge (which was responsible for the genocide) as Cambodia's legitimate government." The U.S. delegation raised the issue of action against "recurring atrocities" in southern Sudan and the eastern and Ituri regions of the Democratic Republic of the Congo. Both the Congolese regions and southern Sudan are rich in oil, casting a less than altruistic light on the Bush Administration motives. In the closing minutes of the conference, Swedish Prime Minister Göran Persson emphasised the need for UN revision and renewal to safeguard multilateralism and the rights of the weak. "If we fail, then we will see the multilateral UN becoming weaker and weaker.and I fear such a situation," he said. Declaration by the Stockholm International Forum 2004 PDF file (one page) on the Conference website. Stockholm International Forum: "Preventing Genocide; Threats and Responsiblities"
Convention on the Prevention and Punishment of the Crime of Genocide Adopted by Resolution 260 (III) A of the U.N. General Assembly on 9 December 1948. Entry into force: 12 January 1951.